A few months ago an EDHREC user, Greg Bateman, came up with an independent Chrome extension called “Better EDHREC” and shared it on Reddit. The extension allowed users to keep track of cards they are considering in a clipboard panel while browsing EDHREC. I loved this idea, so we hired Greg to come over and implement his extension as a permanent fixture of the website and make several improvements over his original idea. It’s finally here, and it’s something I’m personally really excited about! And Don’s not the only one! I’m chomping at the bit to take this new feature for a spin. Whether you’re making a shopping list of cards you need for several decks, making comparisons between functionally similar cards to determine the best one to use, or brewing a Commander deck from scratch, this new clipboard function is a fantastic way to keep track of cards while using the site. What better way to test it out than to make a new brew? If you’re familiar with my article series Forgotten Harvest, I typically focus on hyper-underplayed cards and get into some really weird synergies. Come on a journey with me while I use this new clipboard feature to build a new deck! I really like Izzet commanders, and can never decide on just one, so how about a deck that plays all of them? If I’m making UR legends, I can just go to the Themes page and find a UR commander under the Legends Theme. What’s that? There aren’t any UR legendary creatures representing the Legends theme? Looks like I’ll have to do this the hard way! Time to put the clipboard to use. When you hover over a card, a white [+] appears in the upper-right corner of the card image. Clicking on this [+] adds the card to your clipboard. You’ll see a black box like this one pop up in the bottom-right corner of the screen. 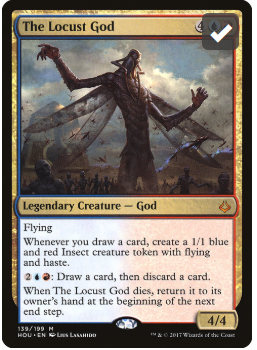 Meanwhile, the card image of The Locust God has changed. It now features a white check mark, signifying that the card is on your clipboard. I’ll add some of my favorite legendary creatures, and then we’ll take a look at my clipboard. Here we can see quite a bit. 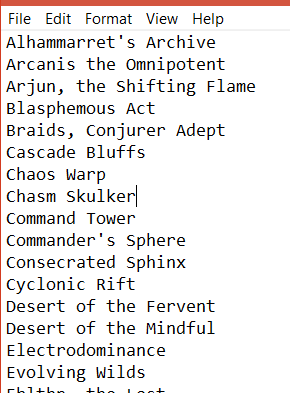 I’ve got 12 creatures added to my clipboard from the Izzet Commanders page. Clicking on each name brings up the card image on the right, the last card I clicked on being [[Nin, the Pain Artist]]. To remove a card from the clipboard, click on the red X for the desired line. To wipe the clipboard entirely in one fell swoop, use the ‘Clear’ button in the lower right corner. To link to a card’s page from the clipboard, click the link icon in a given line (the icon to the left of the X). We’ll discuss the rest of the clipboard’s functionality when I’m closer to having a completed deck. For now, it looks like the legendary creatures I added all have something in common: they’re drawing cards! Time to hit up the Theme page for Wheel decks, I guess, and add a bunch of those cards to my clipboard too! Notice how, as I’m adding cards to this list, it’s added more sections for the different card types (Instants, Sorceries, etc). Additionally, the values listed on the Card Kingdom and TCG Player buttons have gone up. These buttons can be used to shop for the deck on the respective sites! Looking for a budget-friendly boardwipe? You can throw some options into your clipboard, then shoot over to one of the sites and price them out. Want to figure out the price of a deck you’re thinking of putting together? Use the links to those sites to find out! Plus, you’ll be helping EDHREC in the process! Now for one of the coolest parts about this feature: the Recs. Down at the bottom of the clipboard, EDHREC will help me with my deck by making some suggestions. How thoughtful! Based on the cards I’ve already added, it will make some recommendations about other cards that often see play with the things already in my list! To add a recommendation, just click the green check mark next to the card. This will add it to the main list, and your Recs will begin recalculating. Anyway, back to work. I wonder if the Izzet Staples page could help me round this out? There! I’ve got the deck all set! (It may only say 83 cards in my clipboard, but don’t forget that the basic lands each only count for one card.) I think I’m finally ready to make a decision on my commander for this UR legendary card draw machine. It’s going to have to be Jhoira, Weatherlight Captain. I can flag her as my commander by clicking the yellow crown next to her name. This will separate out the commander into its own special section at the top of the clipboard, as seen above. 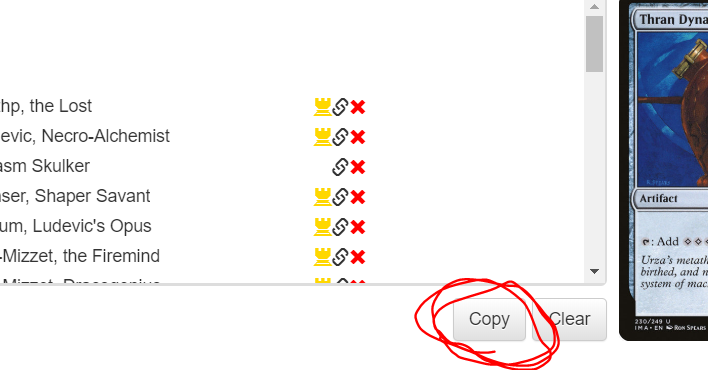 Now that I’m ready to export my deck, I’ll select the ‘Copy’ button in the bottom right corner to copy the list. It’s now paste-able into Notepad or the deck builder website of your choice (perhaps Archidekt, given the article earlier this week)! I decided to export to Notepad so I could format my decklist for this very article! Here you can see it pastes out in alphabetical order. Alright, now that we’ve successfully used the new clipboard function on EDHREC, how about we talk a little about this deck? The point of this deck is to draw cards for extra benefits. We’ve got Chasm Skulker and Psychosis Crawler along with all their draw-trigger friends. A wide assortment of Niv-Mizzets both fuels the draw and slings some damage, and Jhoira will draw us cards every time we play one of these awesome Izzet powerhouses. There’re oodles of ways to pull off a win: combat, burn, life loss, decking out our opposition, Laboratory Maniac… this should just be some fun, raw power at the table. Here you go! Tutorial Complete. Time to Play the Real Game! I hope you’ve all enjoyed this walk through the new clipboard functionality. I know I’ll be using this feature quite a bit as I continue to use EDHREC for deckbuilding. Any questions or comments about the new feature? Please let them loose in the comments section below. Snide remarks about my most recent brew are also graciously accepted. Now go out and give the clipboard feature a spin. You won’t regret it! Midwest transplant to the Pacific Northwest, Kyle has been playing the jankiest of decks for nearly 20 years. He loves non-lethal combos, obscure deck themes, Cloudstone Curio, and winning with Coalition Victory. When he's not tapping lands or brewing decks, Kyle is enjoying his other ridiculously expensive hobby: building with Lego.